Like any other thing that's exposed to the elements, building exteriors too get dirty. 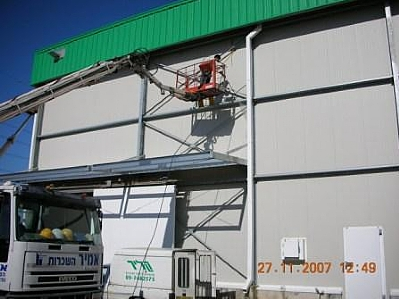 Buildings can have a variety of exterior coatings, including marble, granulite, plaster, textured plaster, Jerusalem stone, ceramics – and all of these coatings can be washed with high-pressure technologies, sometimes combining specific detergents, for a fresh, cleaner look. Note that plaster and textured plaster are relatively soft materials so caution should be taken before using high-pressure water jet. Here too we can achieve very good results.